Lieutenant Kelly was an immigrant from London, England who enlisted in the U.S. Army and, after a time, was commissioned as an officer. After volunteering to the Air Service, he was briefly trained in San Diego, California, by Genn Curtiss. Kelly was then sent to Fort Sam Houston's flying field in San Antonio, Texas, where he would join Lt. Benjamin D. Foulois. His career as a military pilot would be cut short. 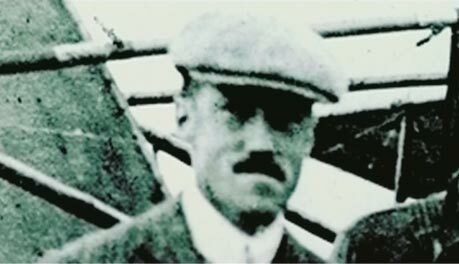 In 1911, Kelly crashed in a training flight when he sharply banked his Curtiss Type IV aircraft. He died from a head injury shortly after. His remains were buried in the San Antonio National Cemetery. The death prompted the Commander of Fort Sam Houston to halt all training flights there at the fort. In November 1916, Major Benjamin Foulois selected the site for the “South San Antonio Aviation Post,” which was later renamed Kelly Field and finally Kelly Air Force Base in 1948. 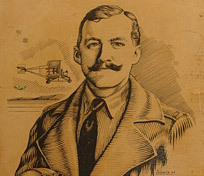 Lieutenant George E.M. Kelly courtesy Wings over the Alamo.